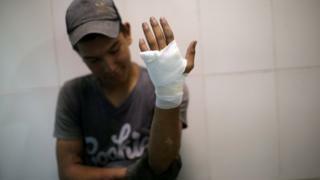 Venezuelan border towns were overcome with violence on Saturday, as tensions over the delivery of humanitarian aid reached breaking point. 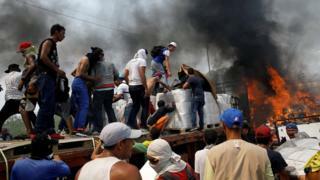 President Nicolás Maduro has partly sealed the country's border to try to stop aid stockpiles being carried over by supporters of the opposition's Juan Guaidó - who declared himself interim leader last month. Here are some of the most dramatic photographs of the day's events. Images from crossing points around the country showed security forces and protesters in stand-offs against each other. 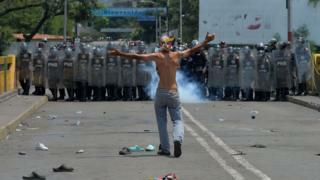 Protesters used shoes and stones as projectiles and also set fires to try to deter military blockages. 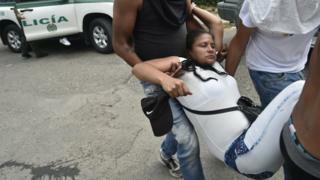 Security forces responded by pushing back and using tear gas to disperse demonstrators. 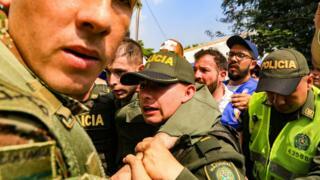 Mr Guaidó has shared messages on social media saying some aid has been able to pass in from collection points in Brazil and Colombia, despite government resistance. 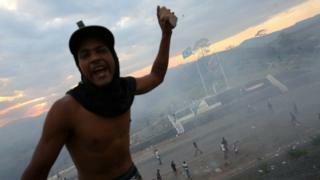 Local media said supporters jumped barricades to cross the border in defiance of President Maduro's closures. 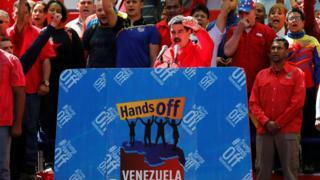 As protesters gathered at the border, President Maduro held a rally in support of his government in the country's capital Caracas. 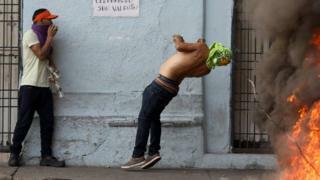 He was photographed dancing at the event and stood at a podium emblazoned with the words #TrumpHandsOffVenezuela - referencing the US support of Mr Guaidó. 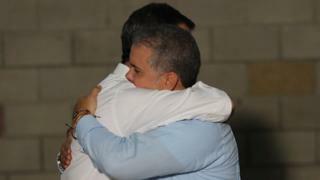 Supports of Mr Guaidó, however, also gathered in Caracas. 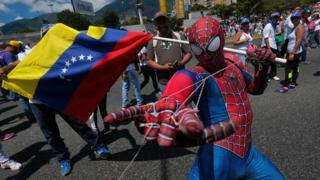 They included this man, who drew attention for wearing a Spiderman costume, while demonstrating with the Venezuelan flag.